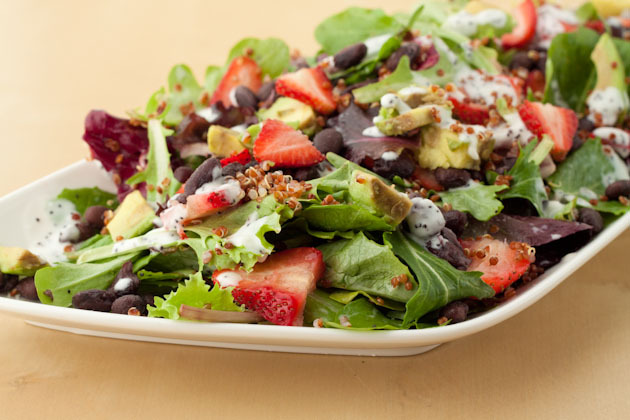 Sweet and simple gluten-free, vegan salad filled with strawberries, avocado, black beans and smothered in a creamy lemon poppy seed dressing. Place water and rinsed quinoa in a medium-sized saucepan. Cover and bring to a boil. Reduce heat to low and simmer for 15 minutes with the lid on. Once complete, remove from heat and allow to sit with lid on for 5 minutes. 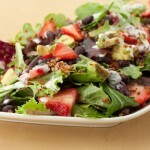 Remove lid, drop quinoa into a bowl and place in the freezer for 10-15 minutes to cool for the salad. Meanwhile, combine salad dressing ingredients in a small bowl. Set aside. Combine all salad ingredients in a large bowl. Pour dressing over top. Add quinoa and serve. xylitol should be ground before adding to the recipe or you’ll have xylitol crystals in the finished product. If you don’t have xyltiol, feel free to replace with maple syrup to keep vegan, or honey.